Today, IBM researchers announced they have demonstrated a new record of 85.9 billion bits of data per square inch in areal data density on low-cost linear magnetic particulate tape—a significant update to one of the computer industry's most resilient, reliable and affordable data storage technologies for Big Data. 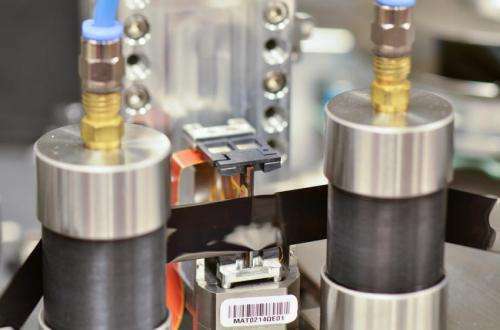 At this areal density, a standard LTO size cartridge could store up to 154 trillion bytes (154 terabytes) of uncompressed data—a 62 fold improvement over an LTO6 cartridge, the latest industry-standard magnetic tape product. To put this into perspective, 154 terabytes of data is sufficient to store the text from 154 million books, which would fill a book shelf stretching from Las Vegas to Seattle, Washington. IBM scientists break Big Data into four dimensions: volume, variety, velocity and veracity and by 2020 these so-called Four V's of Big Data will be responsible for 40 zettabytes (40 trillion gigabytes) of data. Much of this data is archival, such as video archives, back-up files, replicas for disaster recovery, and retention of information required for regulatory compliance. Because tape systems are energy efficient and more cost-effective than hard disks they are the ideal technology to store, protect and access archival Big Data. "Big data has met its match with tape, not only does the technology provide high capacity in a small form factor, it is also reliable for several decades, requires zero power when not in use, is secure in that cartridges cannot be erased at the push of the keystroke and available for the cloud —all at a cost of less than 2 cents per gigabyte and at a greatly reduced operating expense versus disk storage," said Evangelos Eleftheriou, IBM Fellow. 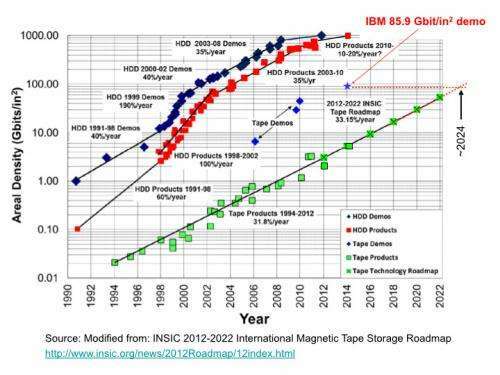 IBM has a long history of innovation in magnetic-tape data storage. Its first commercial tape product, the 726 Magnetic Tape Unit, was announced more than 60 years ago. It used reels of half-inch-wide tape that each had a capacity of about 2 megabytes. The areal density demonstration announced today represents a potential increase in capacity of 77,000,000 times compared with IBM's first tape drive product. 1. New high-density particulate NANOCUBIC BaFe magnetic tape: The enhanced NANOCUBIC technology decreases BaFe magnetic particle volume, which is essential for high-density data recording, while maintaining its thermal stability to ensure long term archivability of recorded data. Developed by FUJIFILM Corporation in Japan in close collaboration with IBM Research scientists, this enhanced next-generation NANOCUBIC tape incorporating NANO coating and dispersion technology and ultra fine, perpendicularly-oriented BaFe particles enables high-density data recording without using expensive metal sputtering or evaporation coating methods.